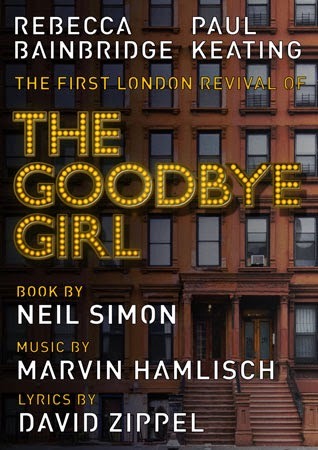 The Goodbye Girl is a 1993 musical with a story written by Neil Simon based on his award winning 1977 movie. It is a fanciful rom-com telling of the blossoming love between Paula a newly-dumped New York single mum and her lodger/landlord Elliott, a neurotic actor from Chicago who moves into her apartment. This production marks the show’s first London revival for 18 years. There is a long established principle in musical theatre, that when tackling a show written around a mediocre book, one should display a commitment to outstanding production values (which doesn’t necessarily equate to a huge budget). There is then a chance that one might, just might end up with a hit. Adam Lenson’s programme notes say that The Goodbye Girl has struggled to “find its feet in large scale productions”. Based on this offering, it is still looking for them. Rebecca Bainbridge and Paul Keating play the star-crossed pair and whilst both actors are competent professionals, neither convinces as the angst-ridden American that each represents. Their singing is passable (though far too often is shamefully inaudible even with mics) and their accents seem cod-USA rather than the passionately brash NY/Chicago tone that their characters demand and which is such a key element to the backdrop of the show’s chemistry. Claira Vaughan’s choreography offers some interesting ideas for the Gatehouse’s compact space, but her company are woefully under-drilled. The venue has only recently displayed excellence in dance with Singing In The Rain. It's a shame that those standards have not been maintained and the lighting plots are clumsy too. Whilst Hamlisch’s music isn’t easy for sure, MD Richard Bates could do with taking his 5 piece band up a gear or two. There are moments of dischord that need atttention. None of the above criticisms are beyond repair and can and should be addressed and to be fair, it’s not all bad. There are some points of classy entertainment on offer with Denise Pitter’s landlady proving a delight, whilst the ensemble’s routine in Too Good To Be Bad is a laugh-out loud treat. Across town, David Zippel’s far sharper City Of Angels closes this weekend, but a song title from that show could be well applied to The Gatehouse’s Goodbye Girl: It Needs Work.